Bring your buyers to this lovely home in Clubside Village of Golden Ocala. Just steps from the Spa & Tennis Center, and conveniently located near the back gate for easy access in and out of the property. 3 minute drive from the new World Equestrian Center. Den connects to a full bath via pocket door for additional guests. Enjoy your open Great Room floor plan with a wall of sliding glass doors that open onto your beautiful private screen enclosed pool and spa and built-in Summer Kitchen. Lushly landscaped and fenced yard offers complete privacy. A lovely year-round home, or an excellent income property with it's terrific location just minutes from WEC. 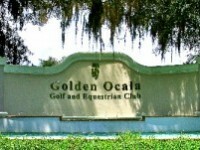 Boarding your horses is also a possibility at the Golden Ocala Equestrian Center.